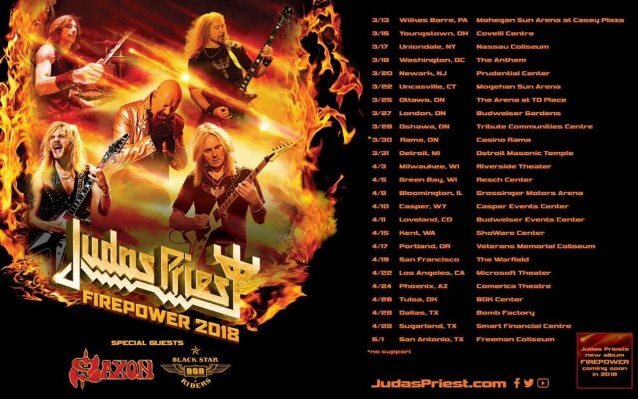 SAXON and BLACK STAR RIDERS have been confirmed as the support acts for JUDAS PRIEST on the British heavy metal legends’ spring 2018 North American tour. The “Firepower” trek will kick off on March 13 in Wilkes Barre, Pennsylvania and will wrap on May 1 in San Antonio, Texas. SAXON recently completed mixing its new album, “Thunderbolt”, for a tentative late January release. The disc will feature the song “They Played Rock And Roll”, written about and dedicated to MOTÖRHEAD. Like 2015’s “Battering Ram”, SAXON‘s upcoming effort will feature singer Biff Byford alongside Paul Quinn and Doug Scarratt on guitar, Nibbs Carter on bass and Nigel Glockler on drums. BLACK STAR RIDERS is made up of Warwick (THIN LIZZY), guitarist Scott Gorham (THIN LIZZY), guitarist Damon Johnson (BROTHER CANE, ALICE COOPER, THIN LIZZY), bassist Robert Crane (RATT) and drummer Chad Szeliga (BREAKING BENJAMIN, BLACK LABEL SOCIETY). The band is currently on tour in support of its third studio album, “Heavy Fire”, which was released earlier this year with Nuclear Blast Entertainment.